Back in March, we shared with you our efforts on building two new test cells to further support risk reduction testing on the BE-4. We began the construction of these additional facilities in October last year and we’ve just commissioned the first of these cells last week. This test cell is pressure fed and supports the development of the preburner start and ignition sequence timing that will be used on the upcoming full scale powerpack test campaign. As mentioned in a prior email, one of the many benefits of a privately funded engine development is that we can make and implement decisions quickly. We made the decision to build these two new test cells as a team in a 10 minute discussion. Less than three weeks later we were pouring concrete and now we have an operating pressure fed test cell 7 months later. Private funding and rapid decision making are two of the reasons why the BE-4 is the fastest path to eliminate U.S. dependence on the Russian-made RD-180. 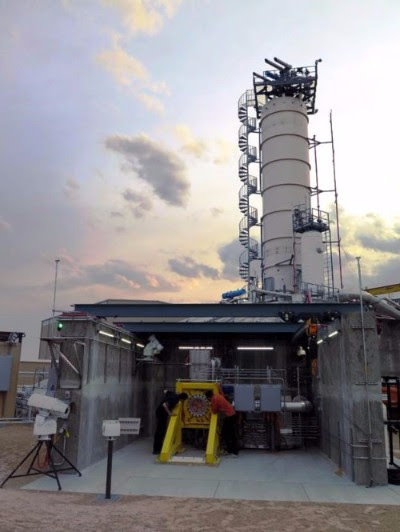 This new pressure fed facility is capable of supporting full scale preburner risk reduction. If you look closely, you’ll see we already have the 14 inch diameter test article integrated into the facility ready for initial testing. More on that as we have it. We’re also finishing our mission planning for another flight of New Shepard, which will be our fourth flight with this vehicle. One of the fundamental tenets of Blue Origin is that the safest vehicle is one that is robust and well understood. Each successive mission affords us the opportunity to learn and improve our vehicles and their modeling. We have stepwise expanded our flight envelope on the booster and crew capsule on every mission. On our most recent flight, we performed maneuvers on the crew capsule to help characterize its aerodynamics and reduce our model uncertainties. On this next mission, we’ll execute additional maneuvers on both the crew capsule and the booster to increase our vehicle characterization and modeling accuracy. On this upcoming mission we also plan to stress the crew capsule by landing with an intentionally failed parachute, demonstrating our ability to safely handle that failure scenario. It promises to be an exciting demonstration. We’ll be sharing more with you about the upcoming mission as we have it. We need you up there launching over and over again.